Description: Lightly pigmented high solids curing compounds. Inexpensive light duty cure. Does not discolor. Description: Non-flammable compound for lifting and dissolving dried curing compounds. Apply to surfaces at anytime to remove hardened curing compounds and concrete sealers. Description: Designed especially for curing compounds. Available with different nozzles for narrow or wide spray applications. Fastest and most complete method for application or cures. Description: Sodium silicate in water solution Ready to use. Also available concentrated and with dye. Curing aid, hardens the surface. 25% solids, styrene-acrylate copolymer resin designed to comply with the newest specification for higher quality curing compounds. Second best curing compound and sealer. It can be used with carpet/tile mastics. Description: 20% acrylic styrene copolymer. Standard grade for most work. Non-yellowing, tought,wear-resistant. Available VOC compliant emulsified or with petroleum thinners. Recommended for all interior and exterior horizontal and vertical concrete. Best general purpose cure, hardener, dustproofer and sealer. Description: Seals, hardens and helps dustproof concrete. High solids liquid penetrates concrete and forms a gel within its pores by reacting with the free lime. Use whereever increased abrasion resistance, a denser surface and greater chemical resistance are needed. Older dusting surfaces can be restored. Description: Designed to comply with various state and federal specifications. Available clear, clear with fugitive dye and white pigmented. Highway paving, sidewalk, curb, gutter, airport runaways, parking areas. Outdoor use only. 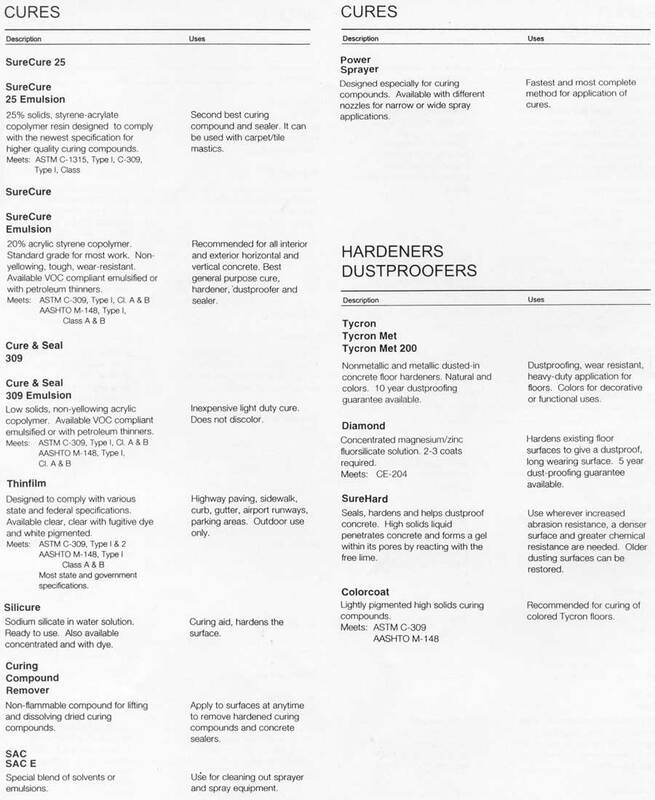 Description: Nonmetallic and metallic dusted-in concrete floor hardeners. Natural and colors. 10 year dustproofing guarantee available. Dustproofing, wear resistant, heavy-duty application for floors. Colors for decorative or functional uses.